As we move from April to May and the days get warmer and longer, consider making your backyard an extension of your family room and kitchen. For a few months each year, you can expand your living space while enjoying the great outdoors. Here are 6 tips for easy outdoor decorating. 1. Start with some cozy seating to facilitate conversation. For inspiration, check out the lovely seating options that Kannoa has to offer. This arrangement seats six. Doesn't that look comfy? 2. 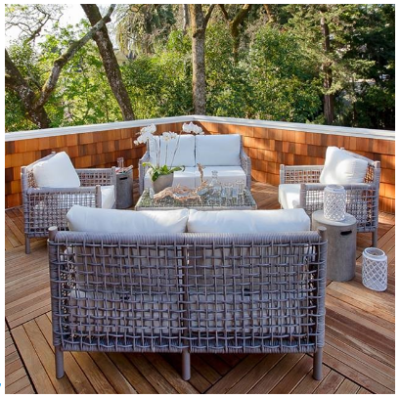 Placing your seating on an outdoor carpet defines the space and makes it feel more like a room. Surya outdoor carpets are just as stylish as their indoor collection and extra durable. 3. Have a basket with a few throws for chilly nights and add some fire. You can purchase a beautiful fire pit, or if your budget allows, build an outdoor fireplace. 4. Outdoor lighting can enhance the ambiance in your new living area. Dangle a chandelier to define your dining area or hang some sparkling little orbs for a romantic starry look. Kichler has a lovely collection of outdoor lighting. Both functional and decorative, pathway lights can help you find your way and cast playful shadows. Don't forget up lights to make trees and shrubs look like artwork. 5. And let's not forget about my favorite thing... dining al fresco! Give your meals a European flavor without ever leaving your yard. This  Lloyd Flandersdining set just transports you to Tuscany! Whether it's an outdoor kitchen replete with fridge and sink or just a cooler and BBQ grill, enjoy a meal outside with family and friends. Bring the colors of the outdoors to your table...add some flowers from the garden and a garage sale mix and match dishware. Keep the meal simple, or better yet, just get take out. I guarantee it will taste better on the patio than in the kitchen. 6. And for those steamy summer nights, relieve the heat with some cooling water. Whether its ocean waves, a gentle rain or a splashing fountain, there is nothing more relaxing than the sound of water. Enhance your outdoor space with a water feature. You can build an inexpensive pond and install a pump or purchase a beautiful fountain. As long as you have an outlet, you're good to go. Not sure where to start? Want to know more about these collections? Give me a call and let's get started on yoursummer oasis.